Conservation regulations aimed at restricting resource use are commonly used to manage and protect natural resources but their implementation depends on the compliance of resource users. The design of effective regulations should be informed by an understanding of the factors that affect compliance, considering contextual socio-economic information. 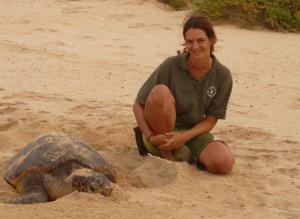 Changes have been implemented in the national legislation protecting marine turtles in the Cape Verde archipelago, where historical and recent records indicate heavy human predation pressure on nesting and foraging marine turtles. We present an assessment of levels of illegal harvesting and consumption of marine turtle products on two of the islands, Boa Vista and Santiago, and an analysis of their potential drivers. Key stakeholders were interviewed to investigate the perceived impact of the main interventions employed in Cape Verde to reduce illegal harvesting, trade and consumption of marine turtles. Despite an apparent decrease in harvesting and consumption, our results suggest there has been a shift from subsistence harvesting to trade in Boa Vista. The existence of laws to protect marine turtles was perceived as a deterrent to harvesting, and awareness campaigns and a lack of availability were perceived as reasons for the decrease in consumption in Boa Vista and Santiago, respectively. Aiming to inform ongoing discussions, we recommend a multi-targeted approach focusing on both suppliers and consumers to magnify conservation effectiveness. Regular impact evaluation focusing on harvest and consumption is needed to improve the design of regulations and inform policy decision making.